Did you know that only 36% of marketers use Instagram(IG)? It’s crazy to imagine, especially with all the hype around the social network, but at the same time, that’s why it’s such a successful platform for the marketers that are using it. One kind of business that really shines on Instagram is e-commerce. What more could you ask for then a platform where you can freely promote your products using beautiful photography? I can think of one thing, the ability to click from your Instagram photos to a landing page where people can purchase your product! The truth is, this doesn’t exist yet. Instagram doesn’t allow live links in updates, or anywhere else on the platform except for in the bio. However, what you can do is use that link in your bio to take your visitors to a beautifully designed landing page that correlates with your status updates. That’s why today, we’re talking about building an Instagram Interactive Gallery that serves as a shoppable gallery for e-commerce folks and a landing page where other businesses can promote their latest products, offers and giveaways. 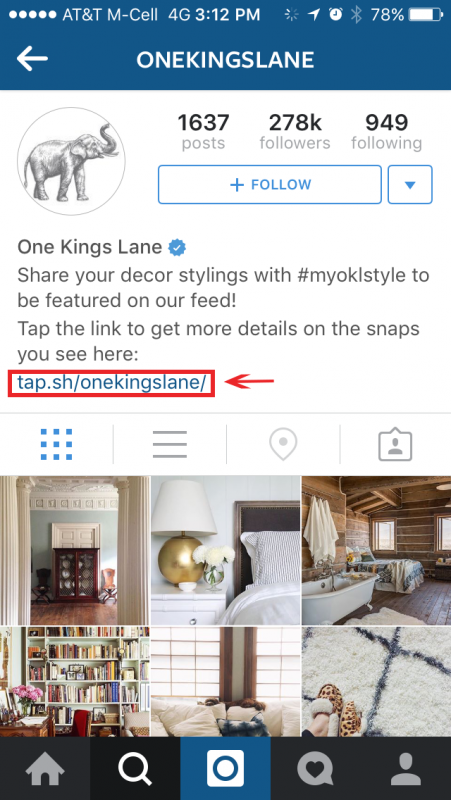 One Kings Lane is an online marketplace that uses their Instagram account to promote their latest products and offers. They direct their Instagram visitors to click on the link in their bio to get more details about their daily updates. Once a visitor clicks on the link they are redirected to a landing page that resembles Instagram. From here, visitors can click on a photo to learn more about that product. While the process of getting from within Instagram to a page on your website where your visitors can learn more is a 3-step process, creating a landing page is the most convenient way to keep everything organized and provide the easiest user experience for your followers. We’ll admit that One Kings Lane is not using ShortStack for their landing page. They’re using Piquora which is a popular Instagram marketing tool. Piquora features an Instagram shopping gallery called TapShop. However, their services may increase your marketing bills by several thousand dollars and it’s geared towards e-commerce businesses. The good news is that any business can create an interactive gallery for your Instagram account using ShortStack’s latest Instagram Template on any of our plans, including the free plan. For e-commerce businesses, the Interactive Gallery Template allows you to create a shoppable gallery. However, the template is also designed to feature links to external pages, contest entries, newsletter sign-ups, downloads or even other pop-ups from within the Campaign. It serves more as a landing page where your fans can click through to learn more about what you’re posting on Instagram. 1. Set your Instagram bio link and forget it: The beauty of the Instagram Interactive Gallery is that you’ll never need to change the live link in your bio again. 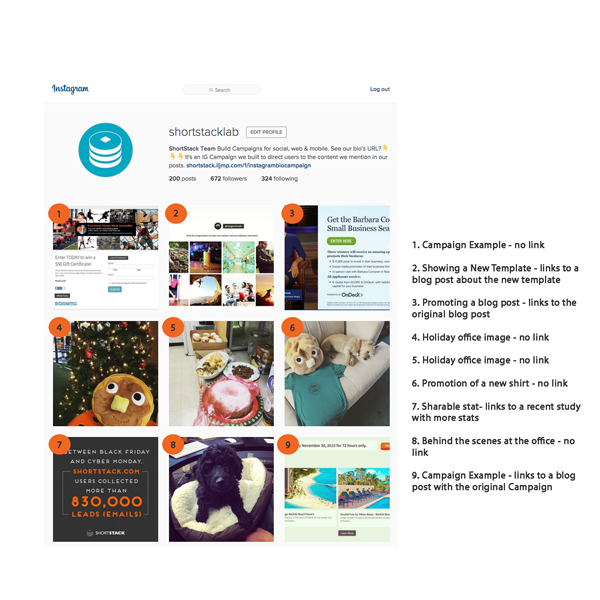 The first step you should take is to build your IG landing page in ShortStack, publish it, and then add your Custom Campaign URL to your Instagram bio. From there you’ll just update the Campaign in ShortStack. Here’s what ours looks like. 2. Use high quality photos: This is a given for anything you post on IG, but the truth is the whole point of your IG shoppable and/or interactive gallery is to get people to click through onto a site where they can purchase or learn more about your offer. The images you use have to be clear, descriptive, and intriguing enough to cause a click through. We recommend testing a variety of different images and you can even add a text overlay if you feel like you need some words. 3. 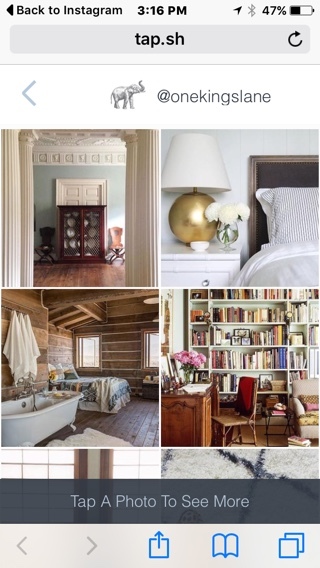 Make your images 400×400: The recommend image size for ShortStack’s Instagram Interactive Gallery is 400×400 pixels. It’s important to always upload your photos into the Campaign at the same size so that the columns on your Campaign do not become disproportioned. 4. Always say “click the link in our bio”: As we’ve previously mentioned, you cannot include live links in your IG updates. This means that you need to remind your audience to click on the link in your bio to learn more information about your offer. We imagine that not everything you post on IG will require a landing page for more information so be sure you’re asking your fans to click the link in your bio when necessary. 5. Don’t overuse hashtags: Hashtags on IG are crucial to growing your presence and getting engagement. In fact, here are 118 of the most popular hashtags being used by marketers. The key to proper and successful hashtag usage is not to abuse them. This comes down to keeping it relevant. While it might be tempting to throw the hashtag #instagood #instame onto every post, it won’t attract the following you’re looking for. Keep hashtags relevant to your post and consider coming up with some unique hashtags that are specific for your business. 6. Get creative with your links: While most businesses are using this type of template for a shoppable gallery, there are a lot of options with ShortStack’s Instagram Interactive Gallery Template. Some of the things you can do is link to a landing page, link to a Campaign, have a form appear, promote your newsletter, link back to your website, or trigger another action on the campaign. When building your Instagram landing page get creative with your posts knowing that you can now grow your email lists, increase your engagement and drive traffic to your website and offers. At ShortStack we don’t have a use for a shoppable gallery, but we post a lot of updates that require a link to an external site. Below is a look at our latest posts and where they are linking to once you click on the image on our landing page.